Proxy Brush: What Is It and How to Use It? Does a Proxy Brush Work Better than Dental Floss? A proxy brush is a type of interdental cleaner. You can use it to clean the spaces between your teeth. Other interdental cleaners include string floss, dental tape, dental picks and water flossers. A proxy brush has bristles attached to a small wire that connects to a small plastic handle. The brush is small enough to go between your teeth. Brushes come in different sizes and if the space between your teeth is too small for the brush to fit, try a smaller proxy brush. It can help you remove bits of food and plaque between your teeth that are easy to miss with your toothbrush. Just as when you floss, you move it between teeth until you’ve cleaned between every tooth in your mouth. If you are a teenager or adult with braces fastened to your teeth, you may have trouble using floss to reaching between your teeth. A proxy brush is often much easier to use. It’s also easier to use for people who have wide gaps between their teeth. Biofilm is a thin, slimy film of bacteria and it forms on your teeth and can lead to plaque buildup, gum disease and tooth decay. Researchers did a study to compare dental floss use with proxy brush use and determine whether one was more effective than the other for removing biofilm. Researchers randomly selected 12 volunteers, who were men and women between the ages of 18 and 50. Over a period of 30 days, the participants brushed and used dental tape to clean between their teeth. Researchers measured the new plaque index at the end of the month. 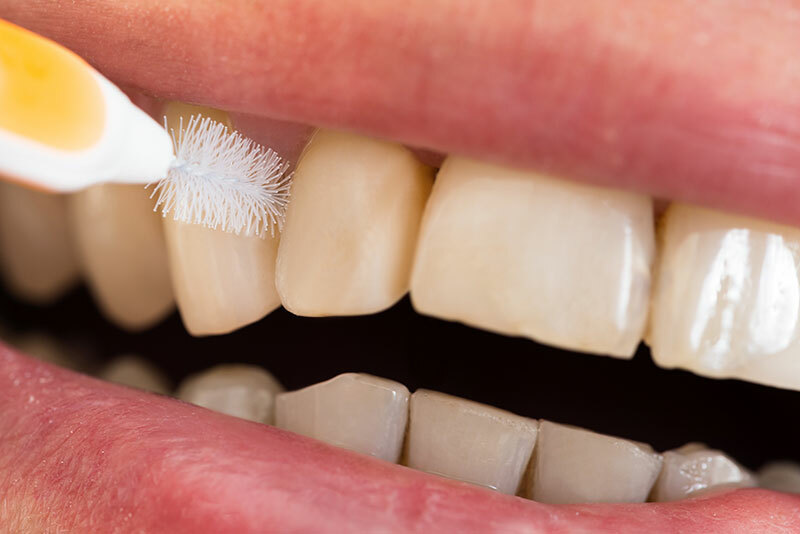 During the next 30-day period, the participants brushed but instead of using dental floss, they used a proxy brush to clean between their teeth. Again the researchers measured the new plaque index at the end of the month. The plaque index was higher when they used dental floss (58.3%) compared with the proxy brush use, which measured a significantly lower plaque index (39.6%). Researchers concluded that the proxy brush was more effective at controlling biofilm around teeth and implants. Where Can You Buy Proxy Brushes? They are available at drug stores, grocery stores and also online. Hutto Hippo Family Dental is glad to help you with dental care or answer any questions you may have.